Pretzel Logic's Market Charts and Analysis: SPX Captures 6th Straight Target Zone; Will Bulls Reach the 7th? 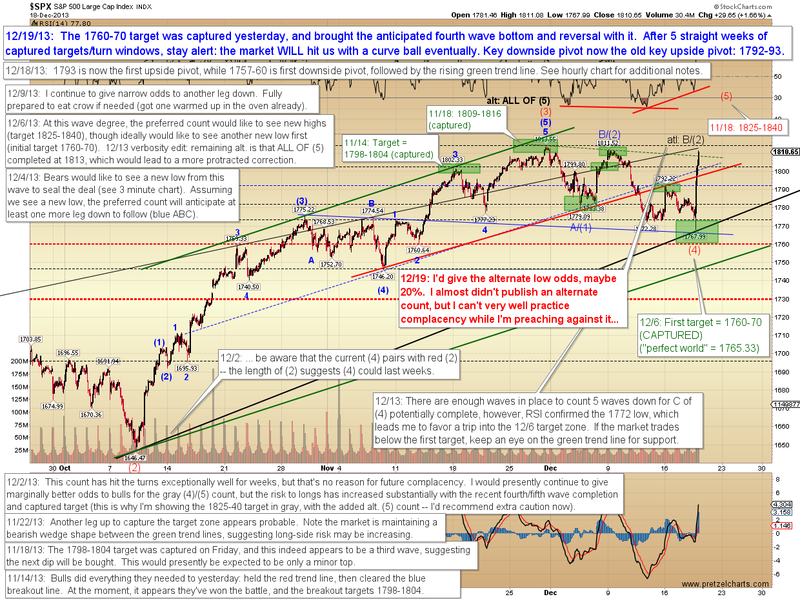 SPX Captures 6th Straight Target Zone; Will Bulls Reach the 7th? Yesterday the S&P 500 (SPX) dipped into the 1760-70 target zone, then immediately rocketed out like a cat thrown into a bathtub. The big news yesterday was the announcement that the Fed will begin tapering QE. Most readers know I'm a technical analyst first and foremost -- which means I believe the charts contain the majority of relevant information that can (and does) tell us where equities are headed. Occasionally, I speculate how the market will react to news, but much more frequently I do the reverse and try to speculate what the news will actually be, based on the projections I'm anticipating from the charts. Sometimes I can predict the news based on the charts -- but then we get days like yesterday where we get a bullish reaction to news which would typically be considered, at best, neutral. And this is why I focus on charts, not news. I can't predict the news -- and even if I could, I can't predict how the market will react to it. Sometimes good news is bad and bad news is good: Yesterday the market decided, "Well, hey... QE taper means the economy's picking up!" and chose to look on the bright side. Given the high momentum of the rally, there's every reason to suspect the preferred count will continue to play out as projected weeks ago, and good reason to believe we're now in the anticipated fifth wave rally. Yesterday's move reminded me of a bear market short-covering rally -- but in a bull market. 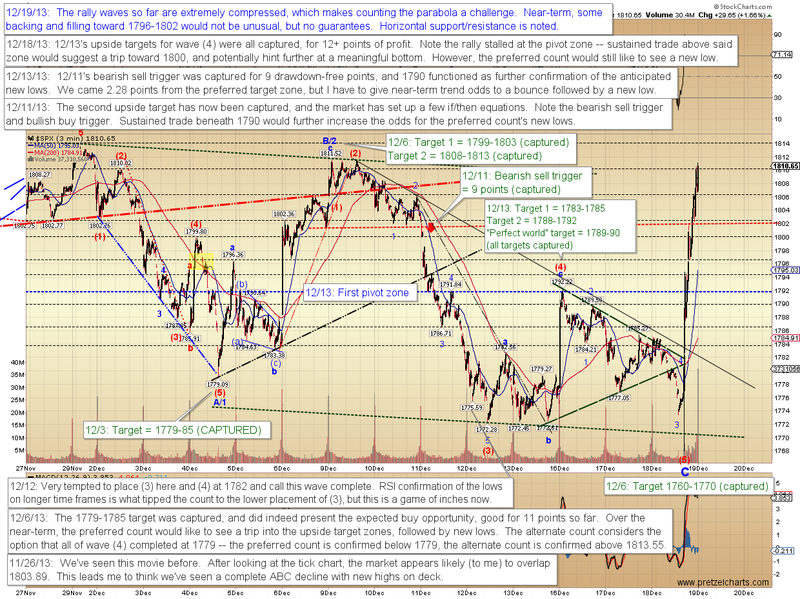 The preferred count would like to see the rally continue up into the 11/18 target zone of 1825-1840. Simple enough. Now the caveats: The first place we'd start wondering about that outcome is the old pivot zone of 1792-93. That zone is not a true invalidation level for the cash market -- I'm actually basing it on a pattern within the E-mini S&P futures -- so it's not a "do or die" level for the cash market. But that's where the caveats would start to come into play: if the market can sustain trade beneath that level, then we'll at least have to consider alternate counts. 1. That the ABC to red (4) was wave a of a triangle, which would then be expected to remain range-bound for several more weeks. That count seems unlikely, due to the ferocity of the rally, which would be unfitting for the b-wave of a triangle. The b-waves of triangles are usually ugly, overlapping affairs -- not strong moves like we saw yesterday. 2. The black alternate count (shown above -- and which has remained since 1813 was hit) is that the rally was wave C of an expanded flat. This count would peak shy of the all-time high and reverse to new lows. I would give better odds to this than I would the triangle, but am presently still giving low odds to this option (as noted in red on the chart above), since the decline counts and reconciles perfectly well as labeled with the preferred count. The main chart still bothering me slightly for the bull case is the Philadelphia Bank Index (BKX -- not shown) discussed yesterday. Again, we'll look at alternates in more detail if the market sustains trade beneath the first key pivot of 1792-93. Until then, we'll simply remain aware that these alternates exist. 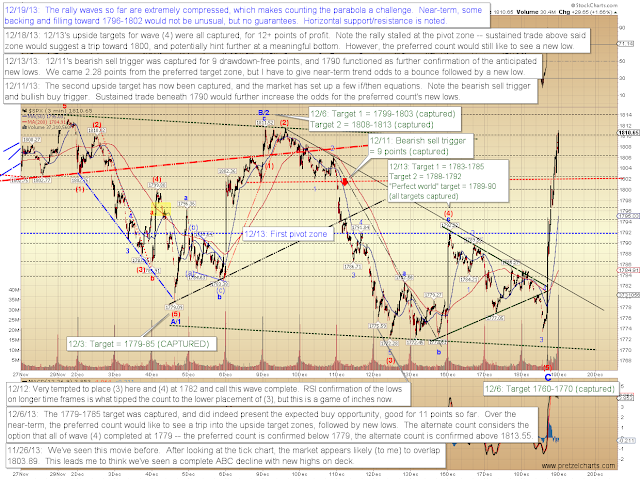 The 3-minute chart notes the challenge of providing short-term projections when dealing with a parabolic wave. I provide such projections when I can -- but I prefer not to swing wildly at any pitches, so I don't have a projection for this particular short-term wave structure. 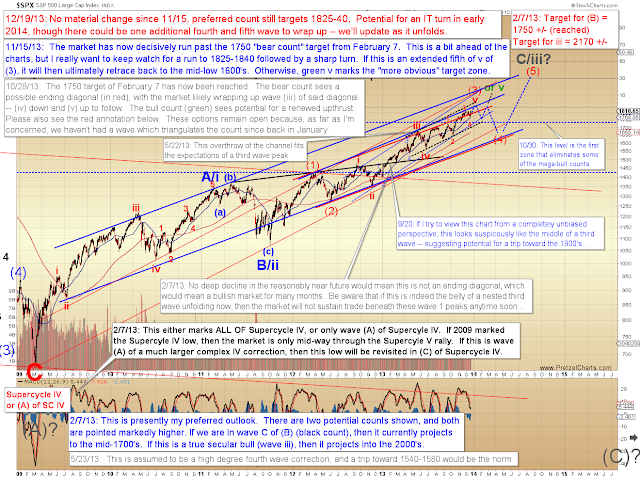 A retrace toward 1796-1802 would be fairly "normal," but isn't guaranteed. 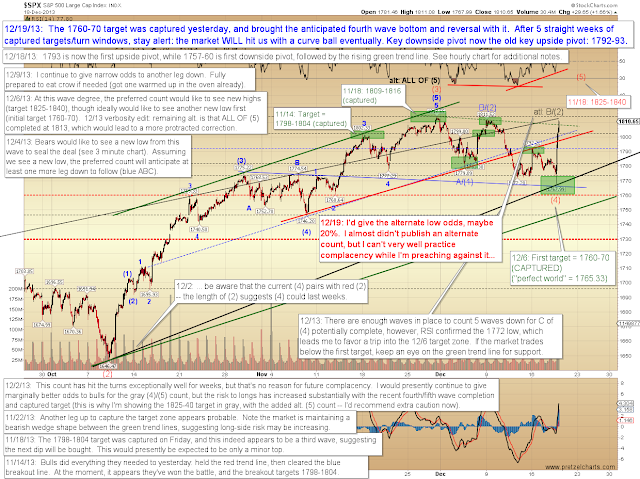 On the chart below, I've noted some horizontal support/resistance levels. And now it's finally time to take a look at the bigger picture again. The daily chart always seems so placid -- almost static -- compared to the micro battles I fight each day interpreting the one and three-minute charts, as I try to unravel, project, and trade the intraday market moves. The daily chart hasn't required any updates for over a month, and is essentially completely unchanged. This next discussion doesn't regard anything the wave requires from a technical standpoint, but is simply my speculative musings: I would almost like to see this (assumed) fifth wave rally march into the target zone rather directly, blowing shorts out along the way (this is purely a technical desire, not a personal one! Sorry bears.). A move like that would clear out the shorts and help pave way for the larger fourth wave correction shown on the chart; and a "straight up" rally would increase odds that the price zone we're in now will ultimately be retested, which is part of the expectations of the preferred intermediate wave count (shown below). We'll see how that goes if and when we reach new highs, then adjust as needed. It is also possible that my projections are too conservative, and there may be one smaller degree fourth and fifth wave left to unwind prior to the larger red (4) -- this is noted in passing with the green "or v" annotation. I tend to discuss the potentials I'm seeing well before they occur, but my hopes are that I don't confuse readers by doing so. Assuming the market does reach the upside target zone, then the charts will contain more information, which will hint at how the masses feel about that price zone -- and thus help guide us regarding better odds for a continuation or reversal. In conclusion, it appears likely the market is in the midst of the anticipated fifth wave rally to new highs (aka: The Santa Rally). 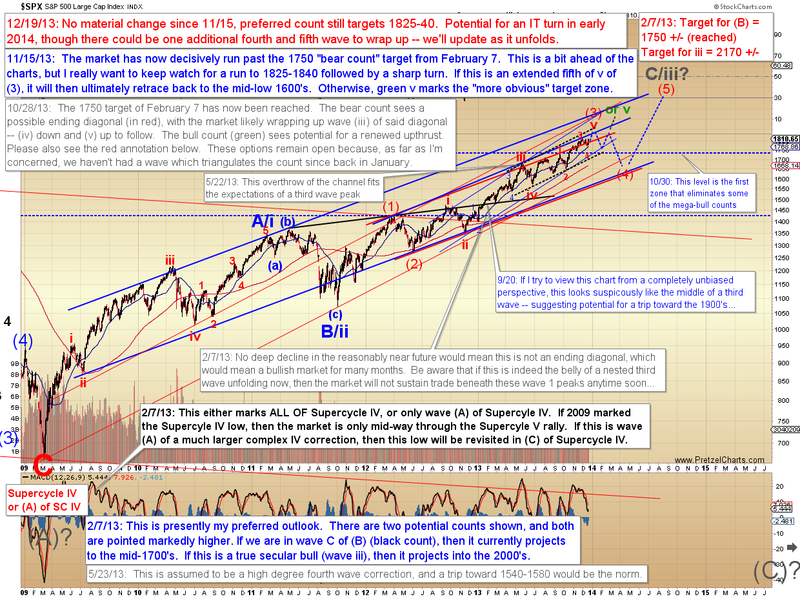 From an intermediate perspective, we may be closing in on a larger correction. Trade safe.